Dogs instinctively want to go on real grass, so training with Fresh Patch is a breeze! This simple, easy subscription box provides real grass training pads that are all-natural, and completely safe to use in the home. After years of just making it as an actor in Los Angeles, founder Andrew Feld decided it was time to take control of his career. With a love for animals, Feld always knew he would work with or help them in some capacity. When pee pads and synthetic grass toilets weren’t working with his own dog, Chloe, he developed his own solution – Fresh Patch! Bringing home a new box or different type of grass to test out with Chloe each week, it took several months before he had a working prototype. With humble beginnings, he made his first deliveries out of his car. Now, Fresh Patch is quickly expanding into the ultimate in-home training system for dogs! 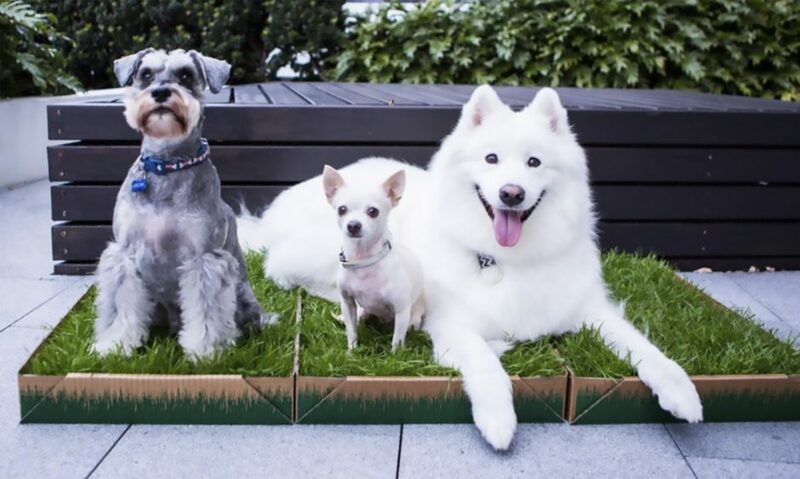 Dogs want to “go” on real grass, and Feld is proud to give our furry friends a convenient way to do so, indoors. The perfect gift for that busy dog owner who wants nothing but the best for their pet. NEW Puppy Pack: Introducing the brand new Puppy Pack! Teach your little Fido to “go” on this soft, real grass that – as an added bonus – has a protective wooden sleeve. Available in both the Fresh Patch Mini and Standard sizes. Fresh Patch Mini: Designed for the smallest of fur children, this 16” x 12” Fresh Patch is customized for pets up to 10 lbs. Whether you have a teacup puppy, cat, kitten, rabbit, turtle, bird or any other tiny pet, let them go when they want – rain or shine! Fresh Patch Standard: Do you have a bigger pooch? Keep them satisfied with the Fresh Patch Standard! 16” x 24” inches, this size is designed for pets who weigh less than 25 lbs. Fully disposable with no parts to clean, just throw away the entire unit when a new one arrives right at your doorstep in two weeks. Whether you give it as a convenient gift for the dog lover in your life, or treat your own pup, Fresh Patch is the innovative solution to late night walks, constant patio cleaning, and so much more. Never make your dog wait for a pee break again with Fresh Patch!